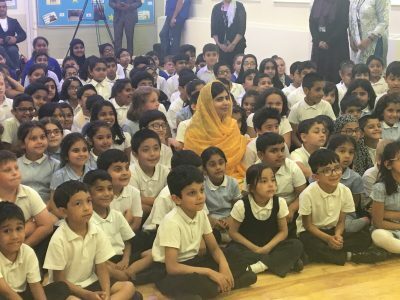 On Tuesday I had the honour of being invited to Carlton Junior and Infants School in Dewsbury to hear Malala Yousafzai address pupils in her first visit to a UK primary school. The Nobel Peace Prize winner, who has connections with the school, was there to unveil a mural bearing her famous words “One child, one teacher, one book and one pen can change the world” and to inspire the children as a role model who embodies the school’s motto ‘dream, aspire, achieve’. I was there as an SMSC Quality Mark verifier to award the school Gold for its outstanding work in developing children’s spiritual, moral, social and cultural learning. Malala is not the first inspirational role model to visit the school, the foyer also contains a mural in honour of the late MP for Batley and Spen, Jo Cox, who also visited the school to speak in an assembly about love, respect, and tolerance. Yesterday, the school was buzzing with excitement as it welcomed Malala Yousafzai and members of her family. Staff, fresh from a Year 5 residential visit to the Houses of Parliament in London, had prepared a presentation showing how SMSC learning is developed across the school. Pupils learn through the charitable campaigns the school gets involved in, the creative curriculum, extra-curricular activities on offer, the strong school ethos and the emphasis on developing positive character attributes such as resilience, bravery and compassion. They also learn through the example set by staff who model respectful and warm relationships, hard-work, kindness and a sense of fun and excitement in learning new things. It was a privilege to see Malala talking to the children about her life and encouraging them to believe in themselves, work hard and use what they learn to make the world a better place. When the children were asked what they thought Malala had needed in her life so far, one of the children said ‘never let yourself be silenced’ and another said ‘never give up’. This is what Gold SMSC learning looks like, and it was wonderful to see. While not all pupils are lucky enough to have someone who has met with Barack Obama, the Queen, Bono and Angelina Jolie visit their school, all pupils should have the opportunity to be inspired by positive role models who show them what’s possible if they can ‘dream, aspire and achieve’.